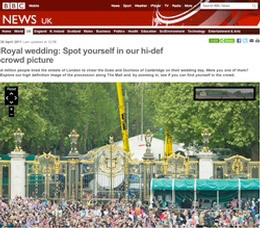 A million people lined the streets of London to cheer the Duke and Duchess of Cambridge on their wedding day. Were you one of them? Explore this high definition image of the procession along The Mall and, by zooming in, see if you can find yourself in the crowd. We spotted one of our 34 metre Brontos and our 61 metre Bronto's (although that one didn't quite fit in the picture).